While I had heard that the Gourmet Food & Wine Expo was taking place this weekend, I was highly unmotivated to go. First, there’s a $15 entry fee. Secondly, you’re forced to buy $1 tickets/vouchers that you hand over to vendors for their samples. In lots of 20. Thirdly, you’re not always getting gourmet. Maybe it’s the snob in me, but last I checked, Lone Star Texas Grill does not qualify. However, having a ticket for the Thursday VIP night ($35!) given to me and a $10 voucher subsidy, I decided that the trip down to the Metro Toronto Convention Centre was worthwhile. I shelled out an additional $20 dollars for tickets, took out my camera, and I was good to go… and wait in line, that is. At least it moved quickly. Once in, trays of wine glasses flank your path. The greeter tells the incoming masses to grab one now or they’ll think you’ll lost yours and will charge you extra for it. After snagging a glass, I noticed I was out of hands. Note: pockets come in handy. Too bad I didn’t have any. Ah well, I’d make do. Bypassing the giant LCBO store booth that seems to dominate the entry, I zeroed in on the sake tasting. 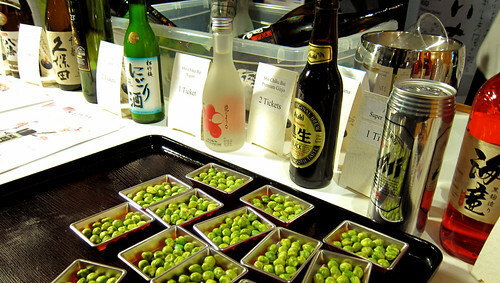 With little trays of wasabi peas. My first ticket goes to sample the Sho Chiku Bai Nigori sake. Sweet, creamy, and light, this was a tasty way to begin the evening. I had wanted to come back and try some premium sake, but didn’t get to it. I swung down aisle one, missing it initially due to the LCBO booth obscuring the path. Intriguing me were Saltfish Cakes from the Antigua and Barbuda booth. They also had Pineapple Upsidedown Cake and another dessert that was described to me as fudge with coconut. That last one was interesting, but I opted f or the Saltfish and Upsidedown cakes. Saltfish was interesting in that never-had-it-before way. Not so tasty as to get another one. The cake was all right, but too large/messy to eat with one hand. I wandered for a bit, bypassing such gourmet places like Lonestar, Canyon Creek, and The Sultan’s Tent (they had a nice booth). I also noted that there was a ton of booze. Nice if you want to get drunk, but I was still sipping my sake. And I wanted to still be able to walk. I was pleasantly surprised to see Ruelo had a booth. With its rainbow of macarons, it was hard to miss. I snagged a passionfruit and a blueberry-lemon. At $3 and $2 a shot respectively, it was a fair price. The chew was okay, though I found the cookie not as crisp as I would prefer. Passionfruit was a good, intense flavour. I got lemon from the other, but missed the blueberry. I also chuckled that the guy behind the counter was touting them as “the latest craze” in Paris. An institution, maybe. Ladurée has been rocking that train since 1930. I wandered some more and ate some free samples of carrot and dip and an apple and caramel dip. Entirely missable, but veggies and fruit I hadn’t seen much of yet. I thought it could balance out the pineapple upside down cake from earlier. Rodney‘s was present and while they were one of a few offering raw oysters, I opted instead for the chowder. Thick and creamy, this was pretty good. Well worth my $2! Having passed many a drink, including some interesting ones I quasi-regretted not trying, I looked at my now-empty glass and wondered what I would fill it with next. Most of what was on offer didn’t seem to spark my interest. I thought maybe I should try something new when I passed the California block. Having spent a happy time in Napa, I recognized the Beringer name and thought I’d swing by in case they had their deliciously sweet Nightengale on hand. Sadly, no they didn’t, but they did have a bunch of wines on offer at various levels. Knowing very little about wine, I just chose the cab-sauv, Goldilocks style. 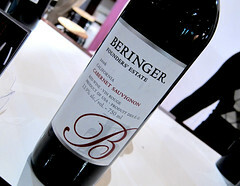 This mid-priced wine was pretty good – very drinkable and just right for me. 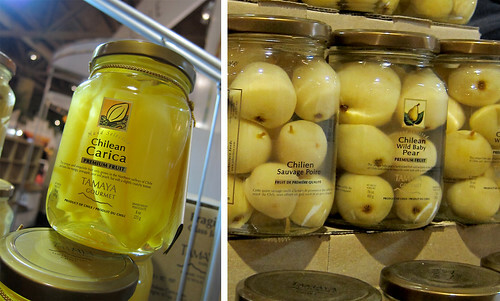 Maybe this is odd, but this bottled Chilean fruit from Tamaya Gourmet seemed to be the most interesting thing to me at the show. For sampling, the vendor offered his Carica fruit and Wild Baby Pear. I was told that it was very European to drop some fruit into your wine, so I played pseudo-Euro and followed the Italian next to me. I quite liked the fruity notes the pear lent the wine and eating it after I had finished my drink was very pleasant. While at the booth, I also tried the Carica fruit (apparently related to the papaya) and quite liked it. More of a crisp mango texture than papaya, reminding me almost of jackfruit. I ended up buying a bottle for $6 to take home. Brix. 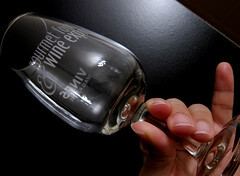 Fancy-branded chocolate to drink with your wine. Free samples were up for grabs, otherwise I wouldn’t have paid a ticket for it. It’s a huge block, but I’d have rather bought a chunk from Callebaut. It wasn’t bad, but it’s just chocolate and not single-origin either, though it was of a particular region, which they touted paired well with wine. Having wandered into the premium lounge that offered a nice seating area with trendy white couches and low coffee tables (the chocolate was located here too), I found the guys from Windsor Arms offering an Angus sandwich with horseradish mustard and caramelized onions. 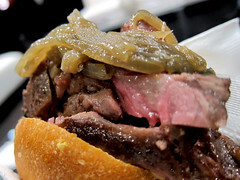 For $5, this wasn’t bad – the beef looked and tasted delicious. Nice and tender too. I got to add a generous spoonful of onions too. Probably the tastiest meal I had of the evening, though to be fair, I didn’t sample the Splendido‘s sandwich offering or the intriguing lobster from the East-coast either. More wandering past wines (I was still working on the Cab-Sauv), and I managed to snag a sample of Xoçai, a supposedly super-expensive health chocolate. Taste-wise, it had a bit of that waxy edge and it certainly wasn’t chocolate I’d opt to eat myself, but I think for the masses, it’d pass. 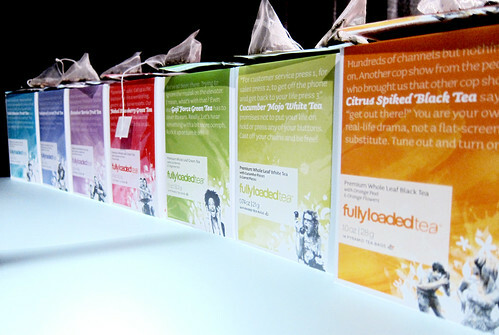 I happened to pass these lovely-looking teas not too long later. Perfectly timed, as I had finished my wine and was in need of something to off-set the chocolate. I opted for the Strawberry Green Tea to see if the flavour would live up to its name. While I don’t think I could have identified it as Strawberry, it did indeed have a pleasant berry taste. Acceptable, in other words, as it far exceeded the hot-water taste that many fruit-teas deliver. 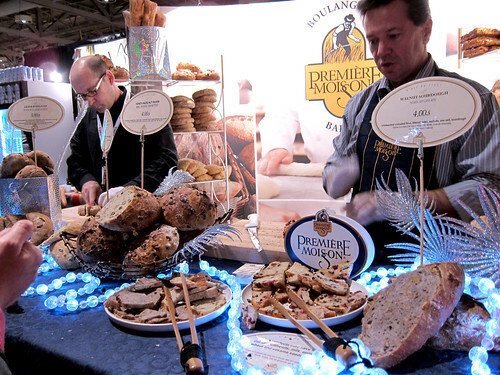 Première Moisson was on the floor with their loaves on offer and samples to tempt you. The booth was busy, so I only mustered the effort to snag a piece of olive cibatta. I had pondered grabbing a loaf for home, but I knew I wouldn’t finish it in time. Still, this would probably pair well with a chunk of La Sauvagine (one of my favourite cheeses) from Alexis de Portneuf (also at the show). Being fairly satiated on food, I looked to see what bites I could spend my last four tickets on. I had to pass up what looked like a half lobster ($6), and kept wandering across the floor in search of something that could triggered my interest. 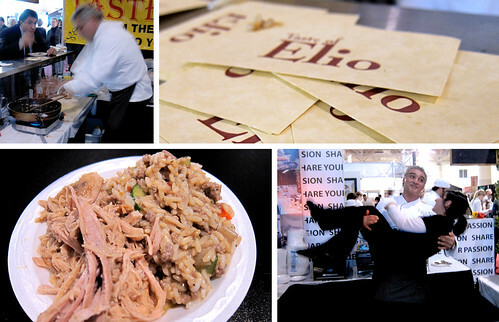 Across from the Food Network stage was Elio offering Venison Risotto, Elk Ribs, and Pulled Pork for $5. I offered my four tickets and a loonie and asked for a mixed plate of Risotto and pork, when I really ment risotto and ribs. Bummer. As expected, the pork was only mediocre and dry. However, I did enjoy the Risotto. Creamy, as it should be. I wasn’t really able to pull the taste of Venison out, so that was a shame. So all my tickets spent, the entire floor covered, tummy satiated – I was done picking my way through wines and nibbles. While I can’t say that gourmet was an accurate addition to the show’s title, it was definitely a pleasant way to spend a couple of hours. However, I certainly wouldn’t have felt the same had I paid for my ticket in. Prices were reasonable if you don’t count the entry-free mark-up, but it felt like there was more wine and liquor than food, and what food there was, there seemed to be an inordinate amount of pulled-pork sandwiches. Would I go again? Only if they waived the entry fee. I had fun, but it wasn’t compelling enough for me to shell out $15 just to step foot in the door. For the total sum of $45, I could have a pretty decent meal elsewhere and I wouldn’t have to wait in line for every bite. If you go this weekend, I’d recommend you bring a tupperware, a fork, and a bag. Would have made juggling everything a little easier!